Romania's capital city is finally getting a stadium fit for a capital, and just in time for it to host the UEFA Europa League 201112 final. 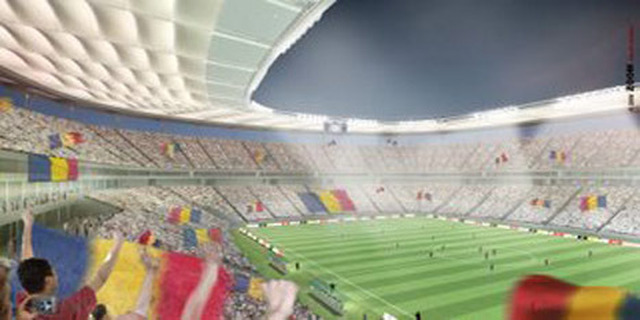 Work on the new National Stadium (Stadionul Naţional in Romanian) began in 2007, and it will be completed in 2010. The stadium will be part of the Lia Manoliu Sports Complex, where it will host the Romanian national team's home games and the Romanian Cup finals. Enough about the stadium though - what you need is information if you plan to attend the Europa League Final in 2012, right? Well, you can browse through Bucharest Life to get the best information on where to eat, drink, sleep, shop, have fun and catch some culture. What are you waiting for - click away! And of course, be sure to check back here regularly as we'll be updating with fresh information as the Europa League Final nears. For more information, please visit the official UEFA site: www.uefa.com. We sure hope this event will help improving the image of our city and will force the city hall to doll-up Bucharest. And no, we cannot have a city packed with tens of thousands of stray dogs and expect UEFA final attendants to enjoy that. Maybe stray-dog-lovers will consider adoption instead of blaming painless euthanasia? While I enjoy football, I will be boycotting this game. As many people do not know, Romania has been MURDERING inhumanely thousands of stray animals in preparation. Maybe if you spent a fraction of the money you are getting on a spay and neuter program, or humanely dealing with this problem you would gain the respect of the worls instead of the disdain. Can't wait! 2012 in Bucharest, here we come!